"The Adventures of Benjamin Franklin" was released in connection with a new exhibition at The Franklin Institute. 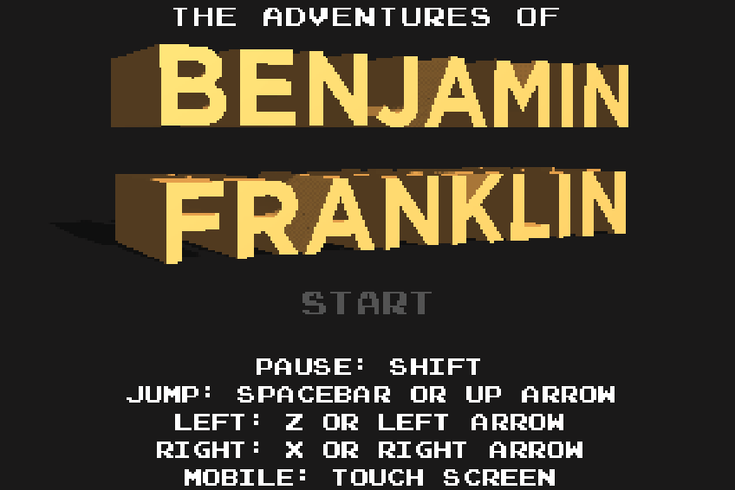 The Franklin Institute just launched a new retro-style computer game where you can collect lightning rods, climb Independence Hall and collect electricity with a kite — all as Benjamin Franklin. The custom-developed 8-bit-style game was designed by the in-house digital team at The Franklin Institute GameMaker Studio 2 to coincide with "Game Masters," a new interactive exhibition of more than 100 playable games (from Sonic to Sims) that will stay at the institute until early September. You can play the game on mobile or desktop, and I highly recommend giving it a try. The main character is, of course, a pixelated little Ben Franklin. He navigates through worlds and into multiple levels, avoiding rats and spikes along the way.